I LOVE cleaning out the fridge and seeing what I can make with leftovers. I made baked chicken a few nights ago and I had some chicken leftover. I had picked up some mushrooms at the store for my husband since he loves them. I figured I would work them into something. By the way, isn't it gratifying to be able to use 3 or 4 things up on a dish? Am I the only one that feels like I am the queen of the universe when I do that? As we were sitting eating the chicken for dinner, he announced, "OMG, can you make me a chicken Alfredo pizza with mushrooms"? Well of course I can darling, anything for you!!!! Uh-huh. So I gathered my pizza dough making ingredients. 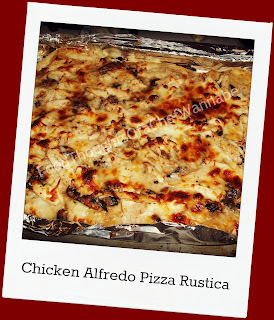 I have, in my opinion and a few other readers opinions, the best pizza dough recipe going. The dough is so gorgeous you are going to want to use it for a pillow! This pizza I call "Rustica" because it is so rustic. Irregular shaped, ingredients of leftovers, yet hearty, heart warming eating! Here is my recipe for Pizza Dough. My dough makes 2 regular size pizza's, but I used the whole ball for a very large pizza! 1 large or 2 small cooked chicken breasts (season them up any way you choose!) cut into small pieces, no shreds for this one guys! Prepare your crust and spread it in any old shape on a cookie sheet, pizza stone or pizza peel. To prepare your sauce, melt butter into a saucepan. Add flour and using a whisk mix while letting the flour cook 1 minute. Add milk while whisking, make sure it is ALMOST at a bubble so it will begin to thicken. Don't stop whisking! Add in parm cheese and turn it down to a simmer, let simmer 3-5 minutes until very thick. Salt and pepper to taste. Let cook just for a couple of minutes. Pizza assembly....spread sauce over pizza crust, add mushrooms and cut up chicken all over the top of the pizza. Sprinkle on Italian seasoning, and cheeses. Bake at 450 for 20-30 minutes. It all depends on how thick you left your crust and how you like your pizza done! 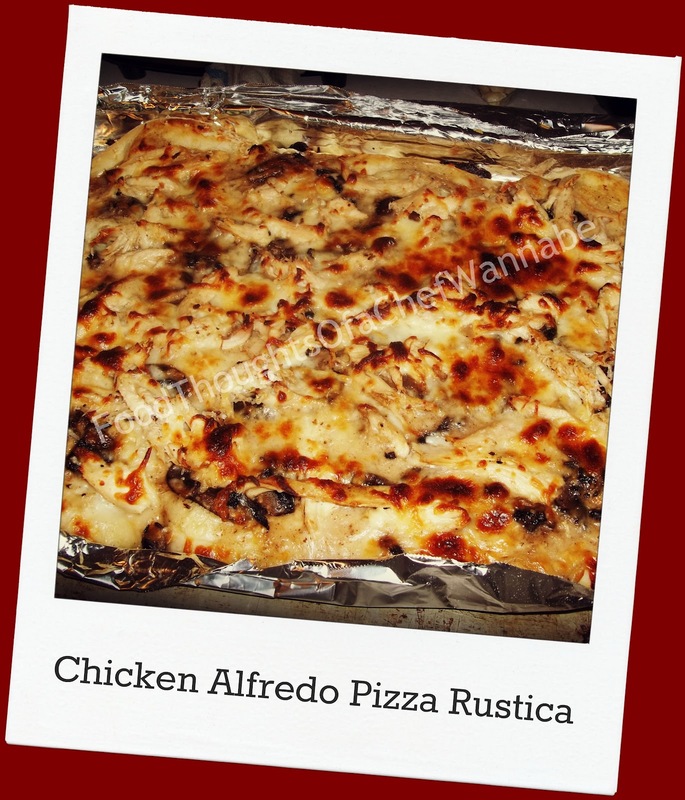 You will come out with a gorgeously browned rustic looking pizza for your eating pleasure! My husband highly suggests you try this one! PS. I just had a thought, someone should try this on the grill. Seriously! If you do let me know! Looks divine...and not too difficult. I'm not brave enough to grill it though. I love your recipes and blog. Even if I am on a clear liquid diet at the moment I'm still awarding you the Liebster Award! Check out my "I'm a Winner" post. Congrats! As simple as it can seem to find a shop offering different types of pizza Fulham and other areas have to offer creating your own pizza can be a fun family activity.